Qingdao Hisense Hitachi Air Conditioning System Co., Ltd. was established in January 8, 2003, a total investment of 200 million yuan, by Hisense Group and Hitachi Air Conditioning co-investment in Qingdao to establish commercial air conditioning technology development, product manufacturing, marketing and customer service one of the large-scale joint venture, is also the current Hitachi air-conditioning in Japan, the largest outside the frequency of Multi-connected air-conditioning system production base. Hisense Hitachi is currently the flagship product for the SET-FREE Multi-connected commercial air conditioning system and SET-FREEmini frequency conversion home central air conditioning system, both using Hitachi's most advanced core technology, sold from Qingdao around the world, including the resale of Japan. 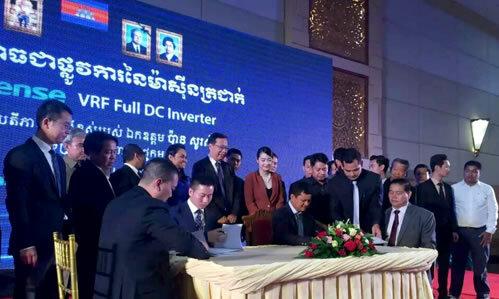 Grand Royal Group and Qingdao Hisense Hitachi Air Conditioning System Co., Ltd. signed an agreement on the conversion of the central air conditioner in 2015 and started to establish an image display shop in Myanmar and Cambodia to establish its own sales network. At present, has established a branch in Cambodia, will build an air conditioning assembly line, the future development of our company has a significant impact and far-reaching significance. May 13, 2016, Qingdao Hisense Hitachi Air Conditioning System Co., Ltd., the exclusive agent in Cambodia, Cambodia, capital of Phnom Penh, was held a letter of the letter of the letter of the business model celebration and Hisense VRF product launch, and achieved complete success. Morning, Qingdao Hisense Hitachi Air Conditioning System Co., Ltd. Deputy General Manager Zhang Jiren and chairman of the Grand Royal Group, Yuan Zhiyou attended the opening ceremony and delivered a speech. The image of the shop is following Indonesia, Malaysia, Hisense VRF in Southeast Asia, the third Hisense VRF show shop, it sets product display, technical training, after-sales service and spare parts service center and other functions in one, professional features and high-end atmosphere Of the store design won the praise of the participants. In the afternoon, the Hisense VRF product conference was held in SOKHA, Cambodian Minister of Commerce Mr. HE Pan Sorasak, President of Try Pheap Group Mr.Oknha Try Pheap, Chairman of Jiayi Group Yuan Zhiyou, Hisense Hitachi Deputy General Manager Zhang Jiren and Southeast Asia Sales Director Liu Tao attended the meeting, while the industry more than 300 professional consultants, builders, contractors and owners attended the meeting, set off a wave of concern for the letter of the letter. Hisense Hitachi Zhang speech, elaborated Hisense brand VRF product internationalization strategy, emphasizing the company's Sino-Japanese joint venture technical strength, the international forefront of quality control standards, and Hisense "integrity of the world, a promise heavy daughter" service concept , won the recognition of the participants. 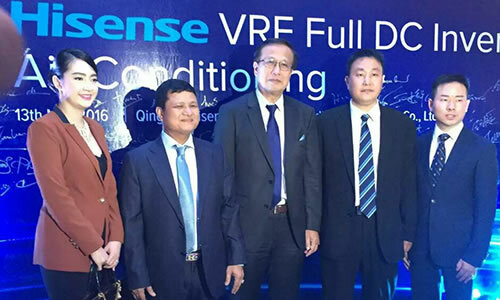 The event has brought great impact to the Cambodian VRF industry, boosted the influence of Hisense VRF in the industry, and demonstrated the strength, confidence and determination of Hisense VRF products to the international community. At this point, Hisense VRF product international strategy has moved forward a big step forward. In September 2013, Chinese President Xi Jinping first proposed “the Silk Road Economic Belt and the 21st-Century Maritime Silk Road”,a major initiative. Grand Royal and Hisense deepening cooperation is the country "the Belt and Road" big strategy positive response, the future cooperation areas are not limited to the frequency of Multi-connected central air conditioning, the two sides will continue in the field of air-conditioning home improvement, home appliances (refrigerators, televisions, Washing machines) and other areas of cooperation, and jointly lead China to create the world.